My sister sent this to me. Very powerful! You know those days...those days that you find yourself at 10:00 in the morning, in the guest room, in bed with a handsome stranger, surrounded by a film crew of 5 led by the church organist? So, these men show up at my house at 8:15 a.m. and I am still in hot rollers...yes, I do require hot rollers to pull of my big ole' Texas hair-do. So I let them in and leave to get rid of one dog and one daughter. Since Kent was there, I let first-born stay asleep in her room. (By the way, I did take out the hot rollers before I left; probably too soon...they said they would be there at 8:30!) After dropping off dog and daughter, I return to find 6 men in my kitchen, waiting for me, one of them in pajamas. They lead me up to my guest room where they have blacked out the windows and set up bright lights and huge cameras. I am then invited to get into bed, fully clothed of course, with handsome actor man in the pajamas. With great acting skill, I then proceed to play "sleeping wife" while he fumbles with alarm clock and expresses great frustration over the early hour and his anticipated commute in horrible traffic. I am pretty sure that I was brilliant in this scene and really looked asleep. Handsome actor man then did some other scene that didn't include me but did involve my coffee pot. I'm sure you, my loyal readers, have no interest in that. We then proceeded on to my big scene where I had actual lines. In this scene, we are having a leisurely breakfast together, thanks to some fabulous new teleconferencing capabilities that allows my hard-working husband to perform his work duties at home as opposed to fighting traffic. We discuss dry-cleaning, the kids, our lunch plans and what to do with his dirty breakfast dishes. Then handsome actor man lovingly kisses me on the cheek and heads into the office in the room next door. Again, after 25ish takes and several camera angles, I am pretty sure that I was brilliant and offers for more acting gigs will come pouring in as soon as this video hits YouTube. We'll have to see how my hair looked however, as I am pretty sure that I had to take out my rollers too soon. 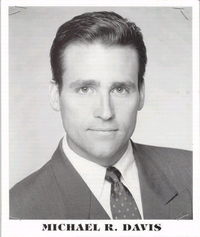 I am probably breaking all sorts of actor's union guidelines, but here is handsome actor man's headshot. Pretty cute, huh? According to his resume, you can see him as a Secret Service dude in "Airforce One" as well as some other movies that I have actually seen. All joking aside, he and all of the crew were super nice guys and we had a lot of fun playing "make-believe." It probably really is a pretty fun way to make a living and I appreciate Kent including me for the day. If you see us on YouTube together, I promise that I was fully clothed in the "bedroom" scene and I only enjoyed the kiss the first 6 or 7 times. Hee hee! My husband often travels to the West Coast and has found the long flights pass more quickly when he takes along rented movies to watch. Generally, he tries to pick movies that I don't care about seeing...you know, those violent "guy" films where I cover my eyes for half the film. Occasionally, however, we misjudge a particular film and he comes home saying "you would love this one." Since we have been together for almost 26 years, he knows me pretty well. Because of that, I trust him when he says I will like it...so far, he hasn't been wrong. That is exactly what happened with the film we watched last night. 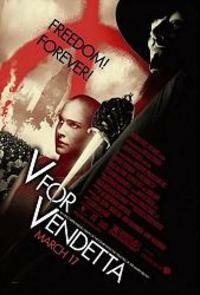 I had absolutely no interest in seeing the movie "V for Vendetta," assuming it was a violent revenge movie. However, once again, he was right. It was incredible! In fact, it may be one of the best films I've seen in a long time. It is a political thriller with frightening overtones from current events. It is all about the politics of fear and about the freedom that comes when fear is overcome. There is certainly violence in it, but violence is not the heart of the movie. The story is about control; specifically, what we allow to control us. As I said, there are elements within the story that are especially terrifying because of how they resemble some of the trends we have seen in our world in recent years. The line that I used to title this post was especially chilling...I won't tell you more! Anyway, I would highly recommend this film. For those of you who, like me, don't care for violent films, I promise the bit of violence in this film is worth it because of the quality of the story. And, Natalie Portman deserves an Oscar for her portrayal of Evey. She was brilliant! If you have seen it, or when you see it, let me know what you think! I have watched the movie "Glory Road" twice in the past week. I watched it with part of my family the first time and thought it was so good that I insisted the rest of my family watch it before it was returned to Blockbuster. In case you are unfamiliar with the film, it is based on the true story of the 1966 NCAA champion basketball team...a team of 5 white players and 7 black players...a racial mix never seen before in NCAA play. I was two years old in 1966...a lifetime ago, yet only 40 short years. 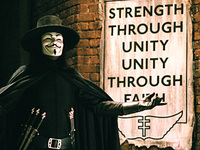 The world that we saw pictured in the film was very different from today. In 1966, only white players were considered "smart" enough to play at the highest levels of collegiate basketball. Obviously, times have changed. In 1966, the black players were spit on and called horrible names as they entered the stadiums, particularly in the South. Obviously, times have changed. At the end of the movie, we watched the bonus features in which they interviewed some of the actual players from that 1966 team. I was moved to tears by one of the gentlemen, probably in his late 50s or early 60s now, get choked up while talking about what they had to endure just to play basketball. Humiliation and degradation because of the color of their skin...just boys who wanted to play basketball. At the end of the movie, as I was thinking about how our world has changed, I thought of this picture that I took at my youngest daughter's birthday party. She made friendship bracelets for herself and her three best friends and she wanted me to take a picture of them wearing their bracelets. 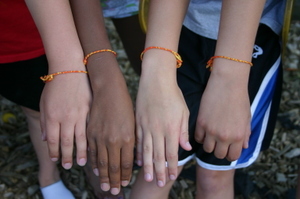 As you can see, the yellow and orange of the bracelets looked beautiful against all the shades of skin represented...none quite like the other. Our world is different because my children are free to play with the children who make them laugh, the children who have similar interests, the children who live next door, the children who stick with them through thick and thin...regardless of the color of their skin. That all sounds really wonderful, doesn't it? Yet, the very night that I watched "Glory Road" the first time, I saw a story on the news about a group of white supremacists who were distributing newspapers throughout one of our local communities...newspapers espousing the same kind of garbage those young men had to endure 40 years ago...the same kind of hatred that I would like to believe we have overcome. Sure, it is better. But, as much as I would like to ignore it, that hatred is still there. While sometimes more subtle, that prejudice still exists. My husband warned me against writing this post when I told him what I was thinking. He says, and I agree with him, that we "white folks" have no right to write about or comment on racial relations. We can notice, but we cannot understand. We can say what it is that we see, we can say what is wrong, but we can't say whether or not it is better. We can hurt for the young men in that story in 1966 or for the thousands forgotten in the Superdome in 2005, but we don't really get it...not really. Perhaps the message of "Glory Road" is to remind us of what we as a society accepted as OK just 40 short years ago...perceptions that seem unspeakably barbaric today that were simply accepted as truth then...accepted by many without question. I wonder which perceptions and attitudes that we blindly accept today will be questioned 40 years from now? We haven't seen The Da Vinci Code yet...hope to see it this weekend. I was reading some discussions online about the movie and I thought the quote below was interesting in its reference to another movie often talked about in the Christian community. I found this statement in the comment section of this interesting post about the movie. "Ron Howard and Dan Brown are going to do no more to destroy the Christian faith than Mel Gibson did to save it. If faith is to be destroyed it will be Christians who destroy it, not Hollywood. The only thing that Christians are going to do in the zeal is perhaps make Ron Howard and Dan Brown billionaires like they did Mel Gibson." I have been meaning to talk about the movie "The Chronicles of Narnia: The Lion, The Witch and The Wardrobe" since we saw it back in early December. Since this idea for a post has been floating around in my noggin the longest, let's start there for today. First of all, you should know that the Chronicles of Narnia are some of my all- time favorite books in the world and C.S. Lewis is one of my favorite authors. While the books were written for children, I first read them as an adult and I have re-read them several times. Steve has read them numerous times as well, and both my girls read the whole series (seven books, in case you aren't a Narnia fan) in November and December before the movie came out. So, with that background, you can imagine that we were at the movie theater the very first weekend it opened! It is simply a beautiful movie. Although it can be disappointing to see your favorite book brought to life, this was not the case for us with this movie. In case you aren't familiar with the books, the Narnia tales are meant to be an allegory of the Gospel message. In the magical land of Narnia, there is a battle between good and evil, a downward spiral into betrayal, and a sacrificial death followed by a glorious resurrection. There are talking animals, valiant warriors, and reluctant monarchs. 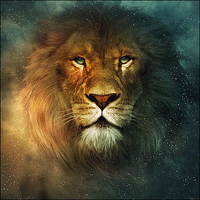 The Lord of Narnia, the Christ figure in our story, is Aslan the Lion. The inhabitants of Narnia have long suffered under the cruel reign of the White Witch when they hear that Aslan is back in Narnia; the word soon spreads, "Aslan is on the move!" Aslan ultimately conquers eternal winter in Narnia through a sacrificial gift of love. As the kingly and innocent Aslan willingly surrenders to the White Witch to pay the debt for someone else's betrayal, he never once seems weak or powerless. The depth of his love for the children and for all the inhabitants of Narnia is apparent as he bears the humiliation of having his magnificent mane shaved off. As the majestic lion allows himself to be shaved, bound and ultimately killed, we sense that he would only have to raise one powerful paw to have stopped it all. Yet, he knows what we don't know at that moment...that through his death, he will conquer evil once and for all. When he comes back to life, springtime comes to Narnia....the long winter brought on by the White Witch is over and goodness and truth reign once again. Clearly, even if you haven't read the books, you can see the connection to the Gospel story. Again, I can't recommend highly enough that you read the books...my description doesn't do the story justice. During the scenes of Aslan's death and resurrection, I wept and wept. In looking back on my experience later, I realized something that I thought was very interesting. Like many of you, I also saw the movie "The Passion of the Christ." While I won't go into a lengthy discussion of my opinion of that movie now, the observation that I had after seeing the Narnia movie was this: my experience of the scene of Aslan's death was much stronger and much more personal than my reaction to the cruxifiction scene in "The Passion of the Christ." I think that I was so distracted...so nauseated... by the intense violence in the Passion, that I couldn't even focus on what the cinematic representation was all about. With the Narnia movie, I was able to watch it and because I was able to watch it, I was able to really experience the symbolism that made it so rich and so moving. That isn't a criticism per se of the Passion movie, just an observation that, for me, I was able to really feel Jesus's sacrificial love for me more profoundly while watching a symbolic lion die than while watching Jim Caviezel get tortured in a Mel Gibson gore extravaganza. (OK, that last sentence did sound a little like a criticism of that movie, sorry...perhaps you are picking up a little on my bias!) Again, that is simply my experience...I'm sure others of you who have seen both movies had the completely opposite experience. Isn't that the beauty of art though? How wonderful that this story is getting told on the big screen in a variety of ways! Anyway, bottom line is this: go get the complete set of The Chronicles of Narnia and read them. While you are buying books, go ahead and also get the C.S. Lewis classic "Mere Christianity"...it is another of my favorites. But even if you aren't a reader, definitely go see the movie "The Chronicles of Narnia: The Lion, The Witch and The Wardrobe." Aslan is on the Move!